You have a caring heart and want to help the families left behind after the death of a patient. As a Hospice Program to receive Medicaid Reimbursement you are required to furnish Bereavement and Counseling services to the family and other individuals in the bereavement plan of care for a period up to 1 year following the patients' death, under the supervision of a qualified professional with experience or education in grief or loss counseling. How do you meet all of your needs and desires on a tight budget? 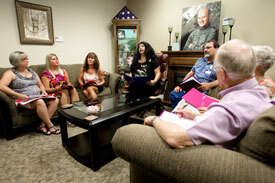 Federal law requires that at least 5% of patient care hours be provided by volunteers. How do you empower your volunteers, meet all the federal requirements, provide quality bereavement care for your families and not break your budget? Support Group Facilitator's Toolkit – provides everything your volunteers with minimal training and supervision will need to run a grief group. Set up to be run as a ten part program allows you to either offer multiple ten week programs throughout the year or as a monthly program can be run as almost year long program. Provides hope in their own words from a ethnically, age and loss diverse group of individuals allowing your population to relate. 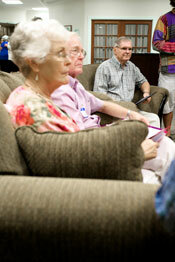 Provides handouts for use in-program and follow up. Non Faith specific – does not value or devalue any one religious belief allowing you to fully serve a diverse population. Does not require any ongoing fees or costs. 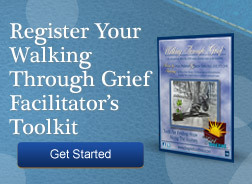 Additional resources to offer the bereaved.